Are you ready to take on a challenge of a life time? 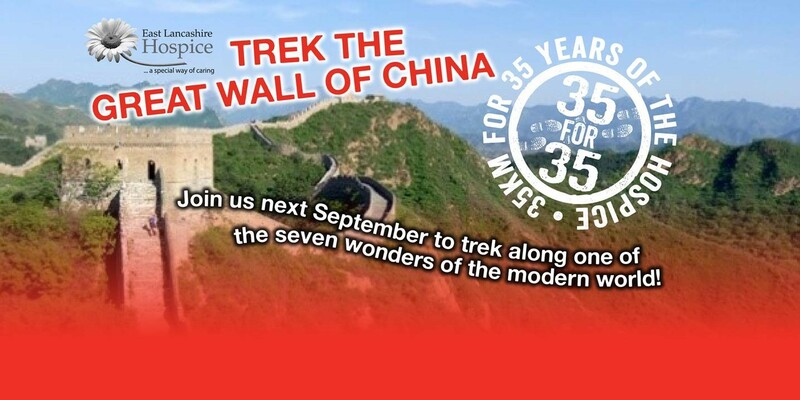 Join us next year on our 35km Great Wall of China trek to celebrate 35 years of the hospice. To register onto the China Trek for East Lancashire Hospice, please visit Global Adventures and enter code INSTALL2 - this voucher code gives you the chance to pay your registration fee in two easy instalments. All information and T&C's about the trek can be found at Global Adventures. If you would like some fundraising tips to reach your sponsorship target or an information pack, please contact Catherine Leech - 01254 287011. The Great Wall of China Trek is a fantastic charity challenge hiking for five days along this magnificent man-made structure. The challenge takes you over watch towers and mountains, through historic battlement stations that are well off the tourist trail. Rest assured, the Great Wall of China provides a fantastic backdrop to some fantastic trekking. We ‘lend a hand’ repairing a section of the Wall that is currently being reconstructed. We will each place our brick in this newly restored section, ensuring our own place in the Great Wall of China! Memories to cherish for a lifetime.